As I was reading through my posts, I realized I barely had positive things to say about our experience in Laos. I flinched upon realizing I had one visitor from Laos and a certain guilt is eating me because, really, Laos is a beautiful place and the people the friendliest and most hospitable I’ve ever met. Sleeper buses: The best Southeast Asia has to offer. They’re big, fast, and super comfy. Pure air-conditioned luxury, with a toilet and a double bed complete with a thin mattress, pillows, and blankets. However, if you’re travelling alone, it would be a good idea to book for two spaces, because the beds are so narrow—unless of course you want to get a little bit cozy with a stranger on a 10-hour trip. Oh, and did I say there’s free dinner, bottled water, and wet tissues onboard? Can’t get any better. Sabaidee: The Laotians spread their sabaidees, their version of aloha, as if it’s the end of the world. All you do is so much smile or glance at them, and you’ll be treated to a genuine sabaidee and a casual but warm conversation about anything under the sun. We had one about Charice Pempengko, the Filipina singing sensation who made it to the American music scene. It’s heartwarming to know that our fellow Southeast Asians also talk about her with pride. Though, I must admit it took me quite a while to realize what the Laotian was talking about. Quite embarrassing. The Park: The park plays a big role in the pastimes of Laotians and of tired tourists. It’s a good way to unwind and go people watching. Children and adults frolicking in the sand. Hawkers offering all kinds of gastronomic delights. Monks strolling along the banks of the Mekong. Young lovers whispering sweet nothings to each other. Tourists catching a glimpse of the magnificent sunset. And Pinky and I shopping at the night street market! Life is beautiful in Laos. Yet another exotic country in your been-there-done-that list. 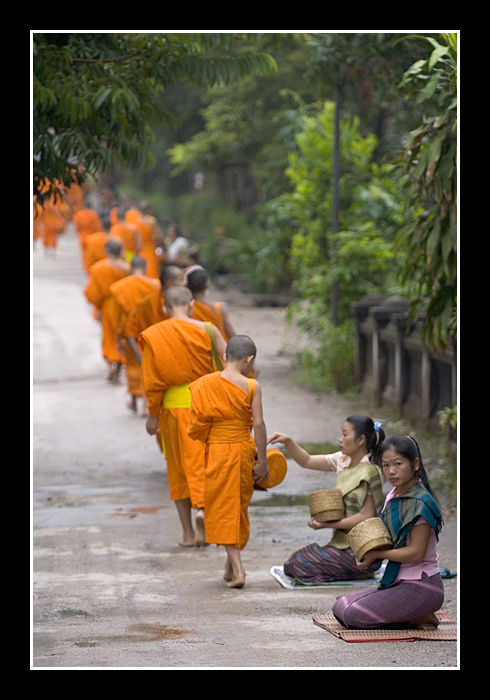 I loved Cambodia so I think I'd dig Laos too, especially Luang Prabang. "A sensual cocktail" and "heavy measure of history" – that's way up my alley! Thanks for this nice little glimpse of Laos.